Theranostics is very pleased to announce the "Most Cited Paper Award" to the paper published in the past two years that attracts the most citations. Citations of papers are based on data from SCI and/or Google Scholar that tracks the journal since its first publication. 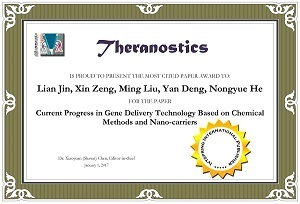 Most Cited Paper Award for year 2016: Winners of this year are Lian Jin, Xin Zeng, Ming Liu, Yan Deng, Nongyue He, for the paper "Current Progress in Gene Delivery Technology Based on Chemical Methods and Nano-carriers". Cited by 174 times (google scholar) or 141 times (Web of Science) as of December 31, 2016. Most Cited Paper Award for year 2015: Winners of this year are Chao Wang, Liang Cheng, Zhuang Liu, for the paper "Upconversion Nanoparticles for Photodynamic Therapy and Other Cancer Therapeutics". Cited by 63 times as of December 31, 2015. Most Cited Paper Award for year 2014: Winners are Mi Kyung Yu, Jinho Park, Sangyong Jon, for the paper "Targeting Strategies for Multifunctional Nanoparticles in Cancer Imaging and Therapy". Cited by 169 as of Jan. 1, 2015. A certificate and $US 1000 have been issued.